Seventhwave Wetsuits is a New Zealand company dedicated to innovative high performance wetsuits for water-sport enthusiasts. 100% New Zealand owned and operated, we’ve been providing specialised wetsuit solutions for people since 1987. Surfing in New Zealand is a major sport and players of all ages frequent our amazing beaches throughout the North and South Islands. Our manufacturing plant and headquarters are based in Bromley, Christchurch — the cold water temperatures of the South Island are our testing ground. Seventhwave Wetsuits are made from the world’s most technically advanced neoprene — Japanese Yamamoto neoprene — and are exceptionally warm, super light-weight and extremely flexible. Research and development is continually undertaken to bring you products designed for functionality and performance, and to give you the warmth and endurance to "SURF ALL DAY". 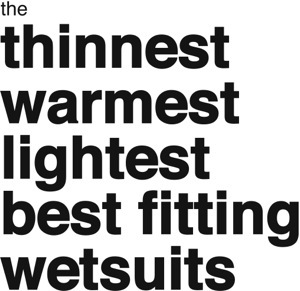 Custom-Fit is our personal fitting service where we can tailor our wetsuits to your specific measurements. If you want the best, then Custom-Fit is it. Custom-Fit = 100% Performance + 100% Comfort = 200% Satisfaction! Advanced Japanese materials and our custom fitting service — coupled with our Lifetime Warranty — means we offer a unique, amazing service delivered direct to you anywhere in the world! See you out the back! We pride ourselves on exceptional customer service, ECS! Without customers we are nothing! zilch! nada! walla-isshi! Our customers are spread throughout New Zealand and the World and we love them. Our products are made to fit, made to perform, made to last, and made in NZ. We want you to know how to look after your Seventhwave gear, so that you get all the benefits from our products. "2008 Top Shop Retail Excellence Awards"
Seventhwave was the winner in the Lifestyle & Fitness category. Seventhwave Wetsuits also won the prestigious "Innovation Excellence in Retail Award". The Top Shop retail excellence awards are organized annually by the New Zealand Retailers Association and are about promoting excellence in retailing and customer service. "2012 TOP SHOP Retail Excellence Awards"
Seventhwave were a finalist in the Lifestyle and Wellbeing division of the Christchurch 2012 Top Shop Retail Excellence Awards. The category and overall winners were announced at the Gala Dinner at the Addington Events Centre in Christchurch on Wednesday 26 September 2012. Our warranty fully covers your gear for any faults in workmanship or materials. Our Lifetime Warranty is on stitching and workmanship. Materials are covered by a one year warranty, but with careful use you should expect 2-4 seasons (or more) from your Seventhwave wetsuit. If you are not happy with your product, send it back to us within 30 days of the date of purchase, in the original packaging and we will refund or replace. Our aim is to provide efficient and prompt sales support and service. Please contact us for any assistance or advice you may require. We repair all brands of wetsuits for all kinds of problems. "Fin cuts, reef grazes, dog bites, heater burns!" You name it, we've seen it before. Our razor-sharp repair service gets your suit back to you before the next swell hits your local break! Just pack your suit into a box or courier bag and send it to us with your contact details. Upon receipt, we will assess the damage, contact you with a quote, then repair and deliver back to you. We've found approximately a third of people don't fit a standard sized wetsuit, so if you want the best fit, maximum warmth and top performance then our Custom-Fit option is it. A Custom fit can be applied to any of our wetsuit models. taken the hassle out of your online shopping experience. Grown out of your old suit? No longer using that old model? Our Trade-in service means you can send in your old or unwanted Seventhwave suit and trade it in on a new one! As long as it has some life left in it, we'll give you a trade-in value or discount off your next purchase. "It’s not just a wetsuit! "it’s a Titanium-lined, Yamamoto neoprene, hand crafted, kiwi labour supporting, surf culture changing, body armour of superb fit, comfort and flexibility."